For the monastery, see Bavanište monastery. 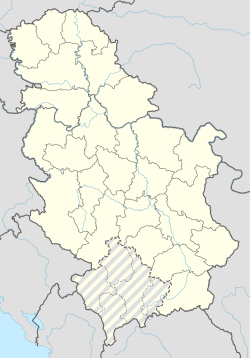 Sakule (Serbian Cyrillic: Сакуле) is a village in Serbia. It is situated in the Opovo municipality, in the South Banat District, Vojvodina province. The village has a Serb ethnic majority (94,82%) and its population numbering 2,048 people (2002 census). Todorov, Anita: Geografski prikaz Sakula, Diplomski pad, Novi Sad 2002. Frank, Jozef: Sakule, 2009 (in Serbian language). Wikimedia Commons has media related to Sakule. This page was last edited on 27 March 2017, at 01:30 (UTC).